Immaculately presented throughout with underfloor heating and a wood-burning stove. Each of the rooms has thermostatic controls, making it warm and inviting throughout the year for guests. Cleverly designed for open-plan living with the superb kitchen/breakfast room leading through to the light and airy sitting room. Spring Cottage is suitable for less mobile guests as the ground floor accommodation is all on one level, with no internal steps, and an easy access shower room adjacent to bedroom 2. There is a slope up to the front door. Sitting Room: fabulous light and spacious room decorated in a contemporary coastal style with glazed doors opening out to the terrace. Guests may relax in comfort with two sofas, an armchair, Freeview digital Smart TV with DVD player, a wood-burning stove with a supply of logs provided. Bedroom 2: beautifully presented room with a nautical decor. Contains full-size twin beds, bedside table and lamp, wardrobe with shelving, full-length mirror and dressing table with chair. Shower room: superb contemporary fittings with a walk-in shower (no step up), hand basin, shaver point, heated towel rail and WC. The stairs are not steep and lead up from the sitting room. Bedroom 1: beautifully appointed room with a Juliet balcony overlooking the garden. Tastefully furnished with a king-size bed, bedside tables and lamps, dressing table and chair, tall-boy, full-length mirror and a built-in wardrobe. Bathroom: high quality contemporary bathroom containing a bath with shower mixer taps, separate shower enclosure, hand basin, WC and two heated towel rails. Spring Cottage is quietly positioned off Cambers Lane down a long shingled driveway (shared with one property) with off-street parking for two cars. There is easy access with a slope to the entrance door. 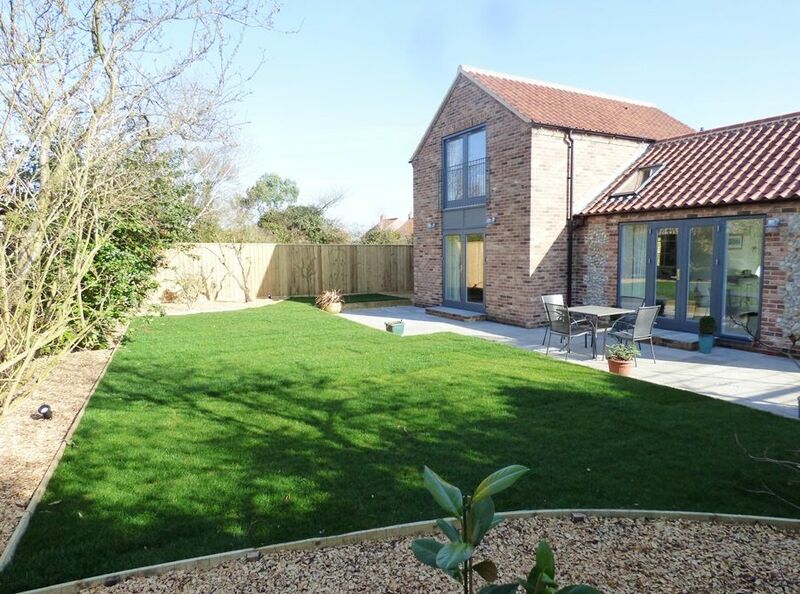 The private rear garden has been landscaped with a lawn and terrace with outside furniture and a barbecue. It is a real sun trap, enjoying sun throughout the day. Whilst it is fenced, please note that there are no side gates so it does open onto the front driveway. 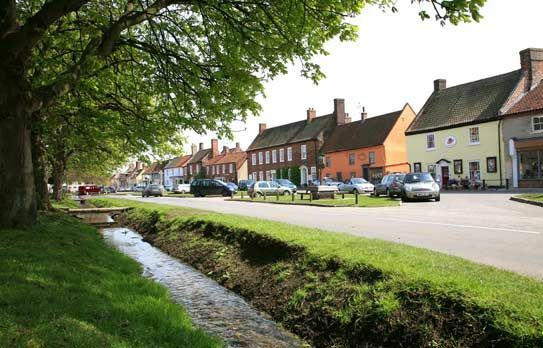 There is pedestrian access onto Beacon Hill Road, where it is only a few minutes walk to Burnham Market's village green. Better than Expected 10 out of 10 for cleanliness and garden space The cottage looked as though it had hardly been occupied. However reading the visitors book this was not the case. This is a commendation for not only the owners by keeping the property, fixtures and fittings in a well maintained order but also for the cleaning staff who prepare the property to this high standard after every visit. There was not anything not to like. Just as lovely a stay as last year, thank you for such a beautiful cottage. Have already booked for next year!! We enjoyed our stay at Spring Cottage very comfortable and well located. Interior lovely furnishings bright and airy, well thought out. It was so beautiful and very well appointed, plus super comfortable. The basket and flowers were a lovely touch too. We all loved it and are booking again for next year, maybe sooner. Wow what an absolutely beautiful cottage by far the best we have stayed in. The welcome basket, milk and flowers really put a smile on my face. We all loved the space inside and out and so peaceful we will come back next year. Thank you Becky. We loved stating in Spring Cottage, Its a beautifully decorated house and the garden is lovely too. We have rented about five or six different properties in Burnham Market, all great, but this is the BEST! It was made extra special for us because of the generosity of the owners providing "the basics" such as cleaning materials, toiletries etc. and a welcome pint of milk in the fridge. We have rented "luxury" properties before which were empty of basics such as loo rolls, washing-up liquid etc. A big "thank you" to the owners for making us feel "at home"
Thank you so much for a lovely stay here in Spring Cottage! We just loved the house, down to every little detail. It is really a place to relax and unwind. We did the 500 piece puzzle and enjoyed the sun in the garden. We really hope to visit again, even if it is a long travel by car from Norway. Comfortable and very well equipped. Next time we come to Norfolk for a holiday we will not be staying anywhere else. Beautiful in every way. The interior was well designed and clean. Exterior perfect. Everything so well thought out to make the perfect holiday let. The best cottage I have rented via Sowerbys. I have used Sowerbys for years and am a regular Burnham visitor but Spring Cottage was the best I have stayed in. Sowerbys and the owner are very friendly people, lovely house, our second stay. One of the best cottages we have ever stayed in, would recommend to others and would happily stay here again. The cottage looked really lovely in the details and we were delighted when we arrived. It was beautifully furnished, well equipped and very comfortable indeed with many thoughtful touches. The location was very good and both bathrooms superb. A very welcoming property in fantastic condition, beautifully appointed. One of the finest cottages wew have stayed in - and there have been quite a few! Spring Cottage is a good size, well appointed and has been very sympathetically built, it exceeded our expectations by miles. It is a compliment to the owners and we would definitely like to stay again. Many thanks for a superb 5 day stay it was excellent. We really liked the decor of this property. Tasteful and excellent quality fixtures and fittings. Purpose built and therefore planned to make the most of the site. It is the best self catering property I have stayed in and I study all the properties. Very warm and cosy would like to live here all the time. A lovely welcome pack, just a very lovely property. Fabulous, thank you - already booked again. A wonderful peaceful cottage presented immaculately. A perfect location for our family honeymoon. A phenomenal cottage in a wonderful location. A lovely week in Norfolk - beautiful accommodation. Loved the cottage, wonderful weather, wonderful Burnham Market, what more can we add? Very clean, better than expected. We liked the open plan layout, plenty of light and a great garden. Lovely cottage, very pleasant and relaxing. Thanks! We have had a brilliant holiday. Spring Cottage is so comfortable and relaxing - we loved everything about it! Very enjoyable stay in a beautifully appointed property. Perfect! Wonderful stay and couldn&apos;t have asked for more. Definitely will be back. Beautiful cottage, great location - peaceful garden- very welcome in this heat. Simply the best holiday cottage we have ever stayed in and there have been many. Thank you. A fabulous stay in a fabulous location. No complaints at all! Thank you. Wonderful stay, peaceful great location. Coming again, Thank you. We have just had a lovely weekend at Vanessa&apos;s Spring Cottage, Cambers Lane. Really enjoyed ourselves, weather much better than expected and a lovely house to stay in. Thank you for such a beautiful cottage in a splendid part of the world. Fantastic holiday in a fantastic house. It&apos;s beautiful. We&apos;ll definitely be back. Great house, warm and inviting.